Kurt Kreckel ’73 is a member of RIT’s Osher Lifelong Learning Institute, which offers classes and lectures on everything from forensic science to Star Trek for adult learners. Kurt Kreckel may have graduated from RIT more than 40 years ago, but that hasn’t stopped him from coming back to learn a thing or two. For nearly five years, Kreckel ’73 (business administration) has been a member of Osher Lifelong Learning Institute at RIT, an organization that helps stimulate minds and forge friendships among people ages 50 and older who live in Greater Rochester. Almost five days a week, Kreckel can be found with friends at Osher taking classes on anything from understanding the human brain to a study of Bollywood movies. Born in Germany in the late 1920s, Kreckel grew up in the midst of World War II. At the age of 10, he was learning to fly glider aircrafts and by 17 he was involved in the war. After being captured by Americans, he grew friendly with many of the soldiers and became enamored with the English language and American people. When the war ended, he pursued his passion in electronics and motors and studied electrical engineering at the University of Hannover. By 1957, Kreckel made his way by boat to the U.S.
Later, he was drawn to a job in research and development at Bausch + Lomb in Rochester—a company founded by German immigrants. He spent more than 40 years as head of Electronic Systems and Military Contracts and was in charge of everything electronic at the company, from spinning machines for the SofLens division to a device for converting 3D stereoscopic film. It was at Bausch + Lomb that his boss told Kreckel he was working too hard. After getting his MBA, Kreckel served as an adjunct assistant professor of management at St. John Fisher College for 10 years. Also in his spare time, he worked with his wife as a medic and ambulance driver with the Perinton Volunteer Ambulance Corps. 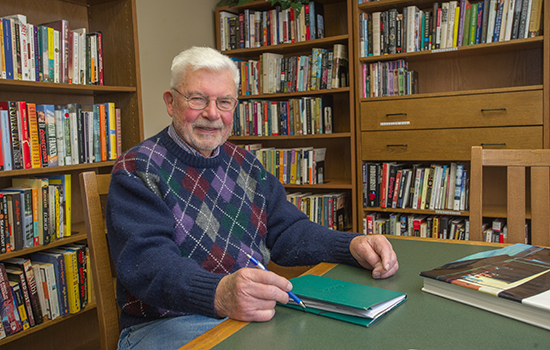 As Kreckel says, he is approaching his 90th year of life and he still enjoys learning something new every day. For more on Osher Lifelong Learning Institute, go to www.rit.edu/osher.